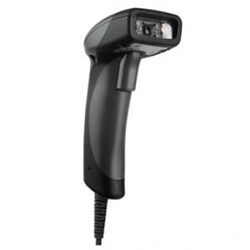 The CR950 is an area imaging barcode reader that rapidly decodes all standard 1D and 2D (including the PDF417 format specific to driver licenses) symbologies. Use it to scan product barcodes at POS and driver license barcodes when you add customers to AIMsi. (Price includes DL barcode scanning. DL parsing is supported in AIMsi v11 and v12.) Note: This scanner is pre-configured with custom settings specifically designed for AIMsi. Scanners purchased elsewhere will not contain these settings and may not be able to fully support the DL parsing functionality without an additional license.